Prior to the establishment of the ‘Royal Bank of Avram’, the Duke had written a doctoral thesis for business administration entitled ‘How to Form and Operate Your Own Bank in Australia’. Exercising the knowledge he had gained, the Royal Bank of Avram was ‘founded’ by Royal Charter and Letters Patent dated 1 October 1980. (The authorities granting the Charter and the Letters Patent are unknown. Evidently the documents were taken by the Australian Police – see below – and never returned.) The Bank is almost as ethereal as the Duchy itself. There are no known directors of the Bank and it appears never to have produced an Annual Report (although as a private entity it need not produce an Annual Report if it pleases). While, on the face of it, the Duke and the Royal Bank of Avram would appear to have contravened these sections of the Banking Act, the Government was unable to successfully prosecute the Duke. In all, six court cases were brought against the Duke, and in each case the court found that there was no case to answer. Subsequent appeals by the Australian Government were also unsuccessful. The matter became a cause celebre in Tasmania and the Duke subsequently stood for the seat of Lyons in the Tasmanian Parliament and was duly elected. He later became the shadow Minister for Construction. 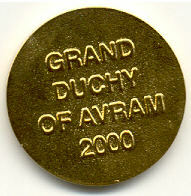 The latest news from the Duchy is that the Avram is now linked to gold as a standard, after about fifteen years of being attached to the United States Dollar. 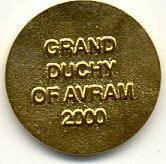 There are currently thirty Avram to one ounce of gold. What this means to the Avram, only time will tell! Further research and investigating about Prince John of Grand Duchy of Avram is described below by Mr. Erik V. McCrea. Each coin has a coat of armorial bearings has been granted to the individuals concerned by Letters Patent. (Again, it is not clear who authorized the Letters Patent.). A coin set of 1,3,7,15,30 and 75 ducals have been produced in 1982, 1985, 1990, 2000 and 2005 each coin bears a different designs of Arms. 250 sets have been issued in each of these mentioned years. The 2005 set has the same designs as on 2000 set. 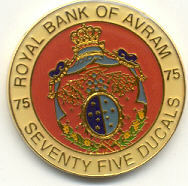 The Royal Bank of Avram recently issued two spectacular multi-colored coins to commemorate the 25th Anniversary of the Bank: a 40mm 250 Grand Ducal, and a 34.5mm 150 Grand Ducal, both dated 2005. The also coins feature the Royal Arms and 250 pieces are minted for each. All these coins are made of Goldine plated Enameled metal with plain edge. I purchased my 1,3,7,15,30 and 75 ducal with unreeded edge of enameled goldine-plated metal coins dated 2000 (Millennium Series) from Joel Anderson. 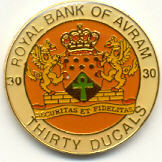 Earlier coins of Duchy of Avram have been listed in Bruce's book "Unusual World Coins".